The document cites Zaidan as an example to demonstrate the powers of SKYNET, a program that analyzes location and communication data (or “metadata”) from bulk call records in order to detect suspicious patterns. Now, there are a few interesting things that come out of this. First, the NSA has phone metadata on phones in Pakistan. 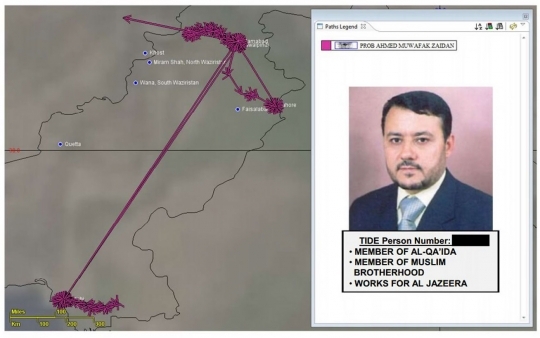 That's found in the other released presentation on the NSA's "SKYNET" (yes, SKYNET) program: But, perhaps the much more interesting tidbit is that this detailed report showing why they think Zaidan is a key Al Qaida courier shows a huge problem with metadata. When you think about it, it really should not be at all surprising that a journalist who is one of the leading reporters covering Al Qaeda might have phone metadata similar to someone who is actually in Al Qaeda. It's likely that he tries to contact them a lot and that he goes to where they are a lot. That's called being a reporter. But, to the NSA, those sorts of distinctions don't matter. Remember, former NSA boss Michael Hayden has outright admitted that "we kill people based on metadata."